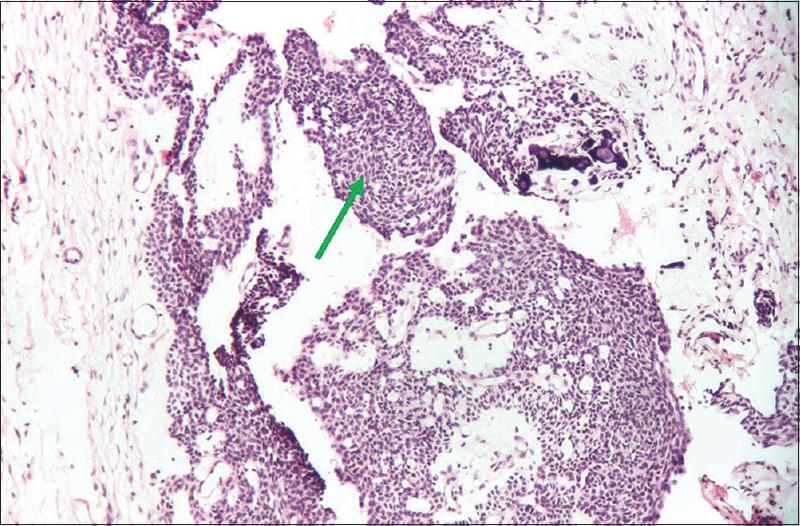 Adenomatoid odontogenic tumor (AOT) was first identified in Steenland's report of “epithelioma adamantinum” in 1905. Various terminologies such as adenoameloblastoma, cystic complex composite odontoma, ameloblastic odontogenic tumor, and odontogenic adenomatoid tumor were used, to describe this tumor, from the years 1905 to 1969. The most commonly accepted term is AOT that was introduced in 1969 by Philipsen and Birn and adopted by the World Health Organization (WHO) in 1971. The WHO defined this lesion as “a tumor of odontogenic epithelium with duct-like structures and with varying degrees of inductive change in the connective tissue. The tumor may be partly cystic, and in some cases the solid lesion may be present only as masses in the wall of a large cyst. It is generally believed that the lesion is not a neoplasm.” Philipsen and Reichart have stated AOT to be a derivative from dental lamina or its remnants. 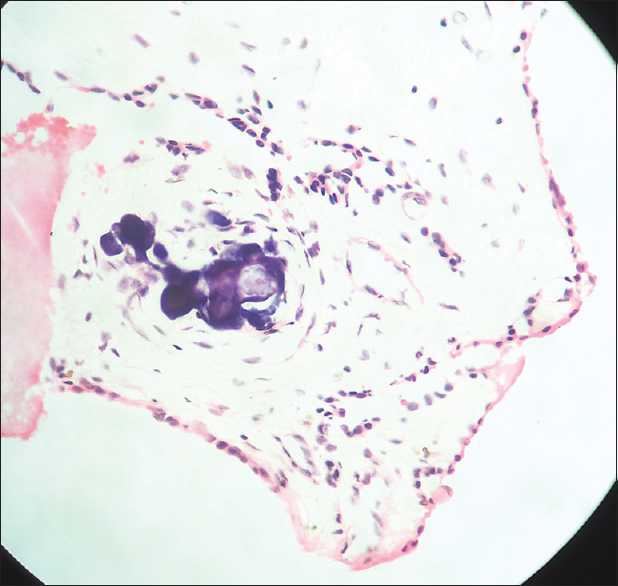 This case report presents unusual clinical and radiographic appearances seen in a histopathologically diagnosed case of AOT. An 11-year-old female patient reported to the department of oral medicine and radiology of our institution, with a chief complaint of swelling in the mandibular anterior region for the last 2 years. There was a history of trauma in the mandibular anterior region, with exfoliation of a tooth (possibly tooth # 81) at the age of 7 years. The swelling appeared in the region of trauma, at the age of 9 years. The swelling was initially small to start with and gradually increased to the present dimensions of 4 cm × 3 cm. There was no associated pain. There was gradual appearance of diastema between the teeth # 41 and 42 as the swelling continued to increase in size. There was no history of discharge from the swelling and no prior treatment taken for the same. There was also no relevant past medical history. On examination, the patient was obese, with normal gait, and well oriented to surroundings. Facial symmetry was maintained. Lymph nodes were not palpable. 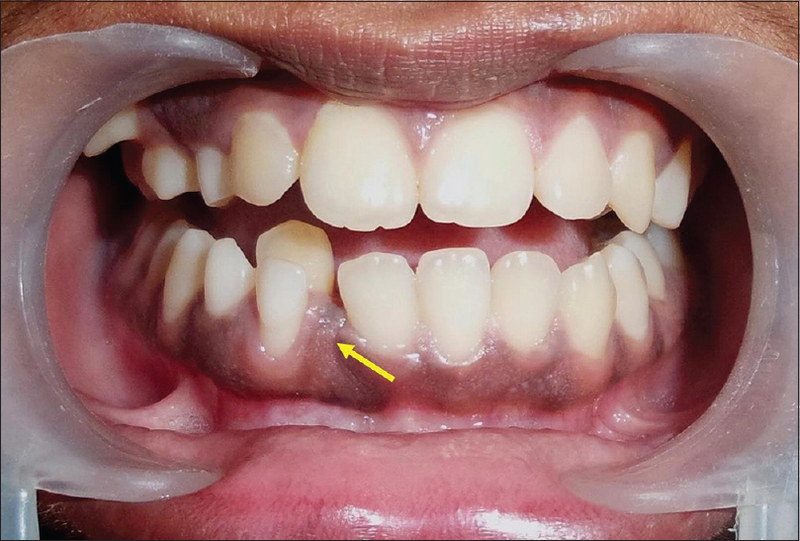 On intraoral examination, a single oval-shaped swelling was noted in the mandibular anterior region, measuring approximately 4 cm × 3 cm, extending from teeth #31 to 42, superiorly rising up to the junction of cervical third and middle third of the crown of 41, extending in the interdental region between teeth #41 and 42, and inferiorly extending up to the gingivolabial sulcus. It was pale pink, with smooth surface texture, rounded edges, margins blending into the surrounding tissues, and teeth #41 and 42 were lingually placed. The overlying mucosa and surrounding mucosa appeared normal. There was no discharge from the swelling [Figure 1] and [Figure 2]. On palpation, the swelling was nontender, fixed to the underlying tissues, firm in consistency on superior aspect and bony hard in inferior aspect, noncompressible, nontranslucent, and nonpulsatile. Based on these features, a differential diagnosis of fibroma, central ossifying fibroma, central giant cell granuloma (CGCG), and odontogenic tumor was considered. An intraoral periapical radiograph [Figure 3] showed a well-defined, unilocular, oval-shaped, mixed radiolucent-radiopaque lesion approximately measuring 3 cm × 2 cm, between teeth #41 and 42 with borders, extending superiorly from the junction of middle third and cervical third of crowns of teeth #41 and 42, inferiorly up to the periapical region, and merging into the surrounding bone. There was distal displacement of teeth #41 and 42 and widening of periodontal ligament space of tooth #41. 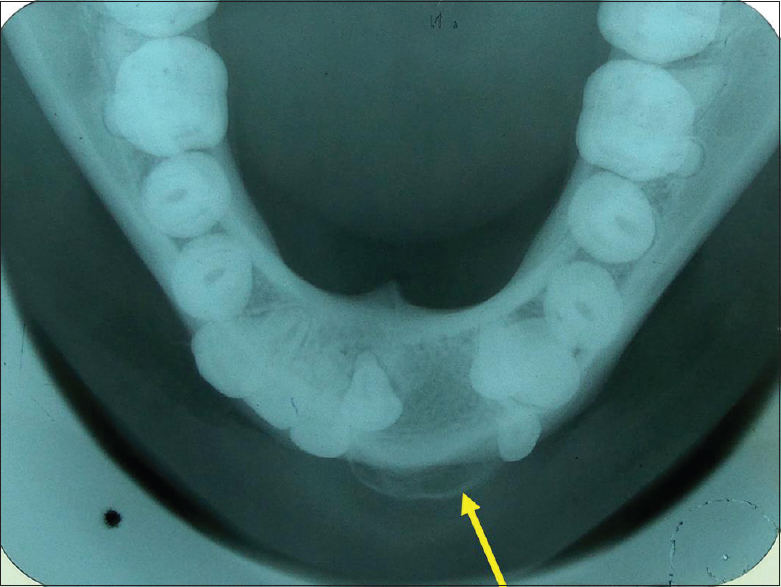 Mandibular true occlusal view [Figure 4] showed expansion of buccal cortical plate in the region of teeth #82-32. 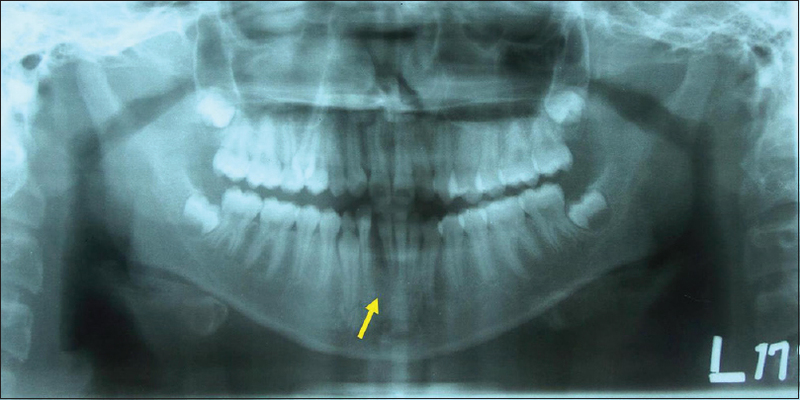 Orthopantomogram [Figure 5] confirmed all the findings of the periapical radiographs and showed the extension of the swelling inferiorly to be approximately 1 cm above the lower border of the mandible. Based on the radiological features, a differential diagnosis of central ossifying fibroma, CGCG, fibrous dysplasia, extrafollicular variant of AOT/odontogenic tumor, and traumatic bone cyst was given. Excisional biopsy was carried out and microscopic examination [Figure 6] revealed hyperplastic, ulcerated, stratified, squamous parakeratinized epithelium with an underlying loose fibrovascular connective tissue stroma. The stroma showed odontogenic epithelium arranged in various patterns. Some areas showed strands/double-stranded cords and nests of cells in swirled arrangements and other areas showed rosettes and ductular patterns. Extensive areas of eosinophilic/amorphous/hyaline/fibrillar material with a few entrapped cells were seen surrounded by odontogenic epithelium. 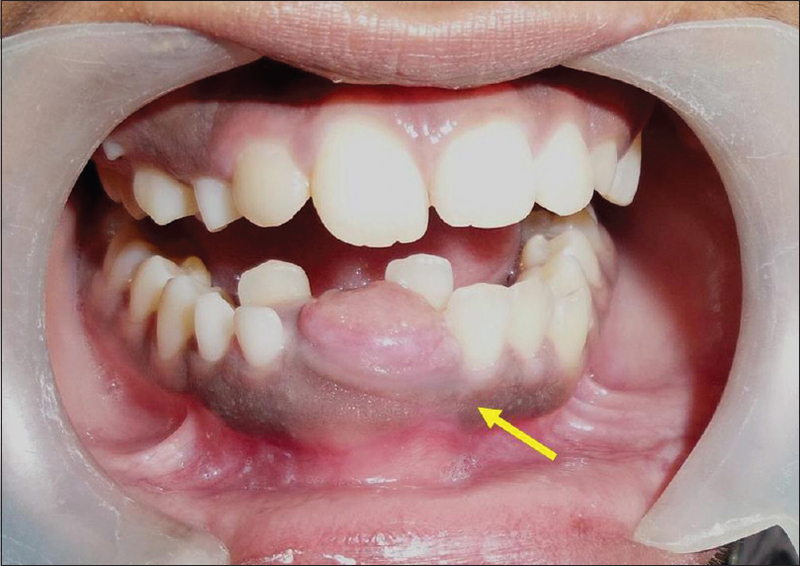 Calcified hematoxyphilic masses as in Liesegang rings and dystrophic calcifications were seen in some areas surrounded by odontogenic epithelium [Figure 7]. Based on the histopathologic findings, a final diagnosis of AOT (extrafollicular, i.e., extracoronal variant) was made. Postoperative healing following the excisional biopsy was uneventful, with a closure of diastema between teeth #41 and 42 and subsequent realignment of teeth #41 and 42 in 1-year time. This could have been due to muscular forces in the adjoining area, coupled with natural tooth movement without any orthodontic treatment [Figure 8] and [Figure 9]. Radiographic examination revealed formation of normal trabecular pattern and recontouring of the buccal cortical plate [Figure 10], [Figure 11], [Figure 12]. AOT is an uncommon cause of jaw swelling that comprises 2.2%–7.1% of all the odontogenic tumors. However, a comprehensive worldwide literature survey by Philipsen and Reichart revealed the frequency of AOT to range from 0.6% to 38.5% of all odontogenic tumors. AOT affects patients in the age range of 3–82 years, more common in the second decade of life, with a female:male ratio of 1.9:1 and the common site being the maxilla, associated with an impacted canine. The age and gender of the patient in the present case were in the range described in the literature. However, the case is significant due to a history of trauma, the site being mandible and the lesion not being associated with any impacted tooth/teeth. However, in a case of AOT, reported by Qari et al., there was an increase in size of the swelling that had persisted for 5 months' duration, following trauma. The three variants of the tumor are follicular (pericoronal), extrafollicular (extracoronal), and peripheral (extraosseous) types. The follicular (pericoronal) variant is associated with an impacted tooth and is radiographically similar to a dentigerous or follicular cyst. 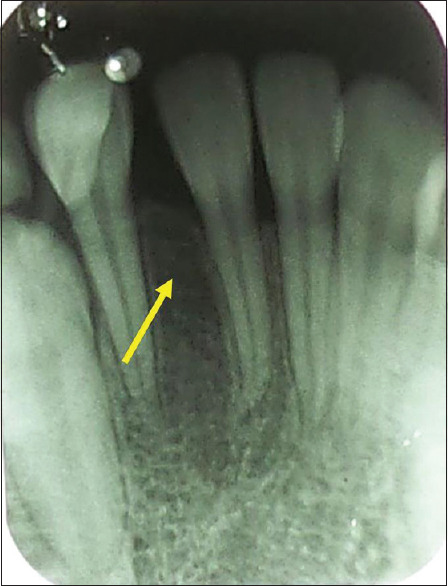 The extrafollicular (extracoronal) variant is not associated with any impacted teeth, the unilocular radiolucency superimposes between/above or over the roots of erupted permanent teeth. The peripheral (extraosseous) variant occurs on the labial gingiva as gingival fibroma or epulis. This variant is rare and radiographic changes are difficult to detect. Becker et al. classified the lesion as predominantly radiolucent that occurred in 98% of the cases and as being radiopaque in 2% of the cases. In their 2012 study, Becker et al. observed expansion of the cortex in 68% of the cases, cortical expansion being more prominent in cases older than 16 years of age. 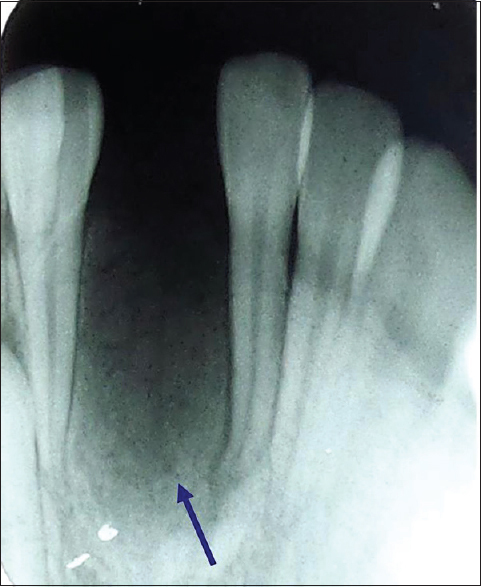 Tooth displacement was present in 80% of the cases and root resorption in 19% of the cases. 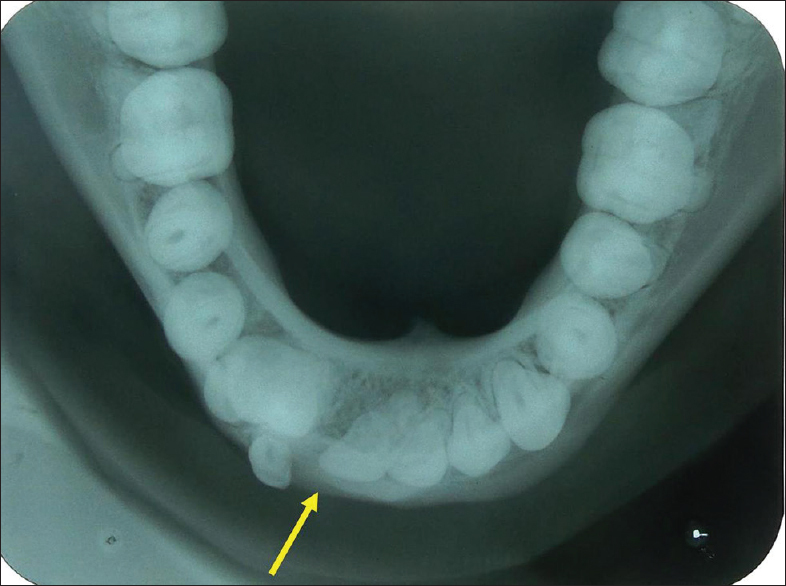 The radiographic findings of the present case, namely unilocular radiographic appearance, with mixed internal structure, expansion of buccal cortical plate, and tooth displacement, were consistent with the literature; however, no root resorption was noted in this case. The location in the mandibular anterior region was also uncommon. Out of approximately 735 cases reported till the year 2014, 13% were reported in the mandible, often in the anterior region and associated with an impacted cuspid. The histopathological feature of AOT shows odontogenic epithelium with cuboidal or columnar cells arranged in nests, cords, rosette-like structures, or duct-like pattern. Calcified bodies with Liesegang pattern (irregular-to-round calcified bodies which may exhibit areas with a concentric-layered pattern) are also seen. The present case too showed similar histopathological appearance. AOT being a well-encapsulated, noninvasive, benign tumor, surgical excision and curettage are the common treatment modalities. When the tooth involved by the tumor has to be preserved, marsupialization or decompression can be considered. If the tumor continues to grow after marsupialization or decompression, surgical excision should be carried out. Recurrence rate is very low, around 0.2%. The present case was treated with surgical excision biopsy and the patient is under follow-up now for 16 months, i.e., almost 1½year. The healing was uneventful with closure of diastema between teeth #41 and 42 and realignment of teeth #41 and 42 with the formation of normal trabecular pattern and recontouring of buccal cortical plate. 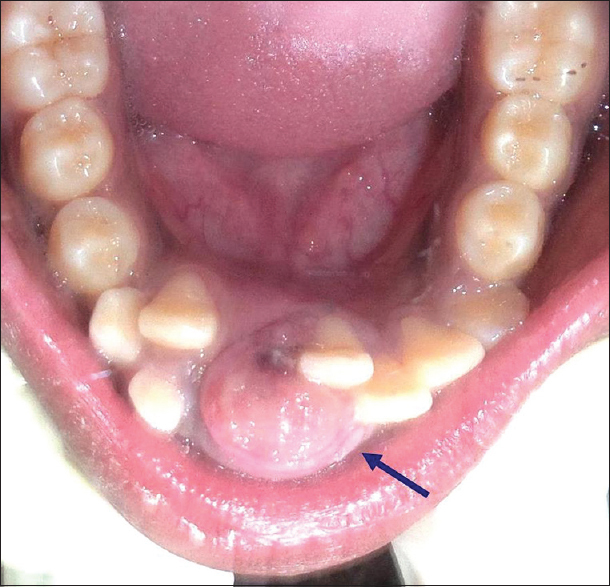 It should be considered that odontogenic tumors can manifest with uncommon presentations. The history of trauma in this case was misleading that led to the differential diagnosis of CGCG and traumatic bone cyst. 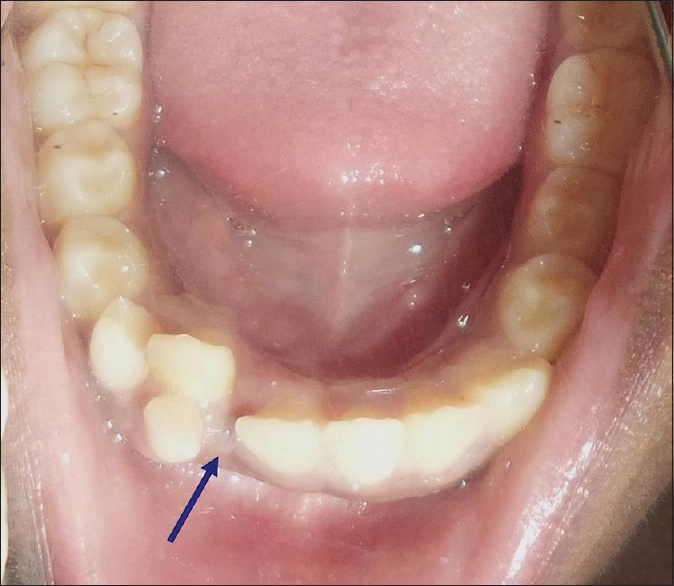 Although there is clinching histopathological evidence which confirms the diagnosis of AOT, radiographic features of mixed lesion, expansion of buccal cortical plate, and tooth displacement are also contributory to the diagnosis of AOT. Hence, thorough history, clinical examination, and radiological examination along with histopathology are essential for final diagnosis and effective management. Unal T, Cetingul E, Gunbay T. Peripheral adenomatoid odontogenic tumor: Birth of a term. J Clin Pediatr Dent 1995;19:139-42. Mutalik VS, Shreshtha A, Mutalik SS, Radhakrishnan R. Adenomatoid odontogenic tumor: A unique report with histological diversity. J Oral Maxillofac Pathol 2012;16:118-21. Becker T, Buchner A, Kaffe I. Critical evaluation of the radiological and clinical features of adenomatoid odontogenic tumour. Dentomaxillofac Radiol 2012;41:533-40. Qari H, Blundell G, Demian N, Covinsky M, Bouquot JE. Massive, mixed, cystic lesion of the mandibular midline. Oral Surg Oral Med Oral Pathol Oral Radiol 2014;118:9-15. Langlais RP, Langland OE, Nortje CJ. Diagnostic Imaging of the Jaws. 1st ed. Baltimore: Williams & Wilkins;1995. p. 305-15. Wood NK, Goaz PW. Differential Diagnosis of Oral and Maxillofacial Lesions. 5th ed. St. Louis, Missouri: Mosby; 2006. p. 27. Reichert PA, Philipsen HP. Book Entitled Odontogenic Tumours and Allied Lesions. London: Quintessence Publishing Co., Ltd.; 2004. p. 105-15. Shetty K, Vastardis S, Giannini P. Management of an unusually large adenomatoid odontogenic tumor. Oral Oncol Extra 2005;41:316-8. White SC, Pharoah MJ. Oral Radiology: Principles and Interpretation. 6th ed. Philadelphia: Mosby; 2009. p. 382-5, 428.